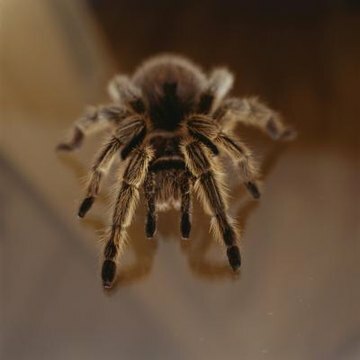 Although many different species of tarantula have the ability to "throw" the toxic hairs covering their bodies, certain types of birds consider them ideal food sources. The ability to potentially poison predators in this manner keeps them safe from many creatures, but tarantulas are preyed upon by large, daring birds. In the jungles of South America and the desert areas of the southwestern U.S., owls prey upon tarantulas. Barn, western screech, spectacled and elf owls have diets that include the large spiders. These owls hunt at night, while temperatures are cool and insects (and spiders) are most active. They rely on speed and their talons to ensure they catch their prey quickly and efficiently. Owls only prey upon appropriately sized spiders -- smaller species typically hunt immature spiders, especially in the jungle where the leg span of some tarantulas can reach over 8.5 inches. Large and chicken-like, the Geococcyx californianus also preys upon the tarantulas that are abundant in the deserts of the southwestern U.S. and Mexico. This omnivorous bird's diet includes small mammals, other birds, insects and even fruit. For larger food sources, the greater Roadrunner uses its speed during the hunt to follow prey and then beats intended meals against the ground or a rock while holding the catch in its oversized beak to complete the kill before swallowing it whole. Reaching up to 21 inches in length, this bird's ability to handle large spiders and animals ensures that it has ample choices. The diet of these omnivorous birds consists mostly of fruits, but toucans also eat spiders and other insects. Though their bodies average 25 inches long, their elongated bills can reach lengths of 7.5 inches -- and are used more for finding food than for fighting. Using the bill to catch spiders saves the bird from a potential spider bite and ensures that the tarantula is incapacitated or dead before ingestion. Toucans do not chew, so no matter what their meal, they simply scoop it into their bill and tilt their heads back to swallow. The Piranga olivacea, though native to the eastern U.S., spends winter in South America and adapts its food sources annually. At only about 6.7 inches in length, these birds are not capable of feeding on some of the larger tarantula species, but the smaller ones, as well as other spiders, insects, and plants are no problem. For the larger prey, the scarlet tanager relies on its ability to hover before striking, and then if necessary will kill larger food sources like tarantulas by pressing them into the branches of the trees they live in. Although the males are red-colored when in the U.S., during their time in South America, their feathers turn green and yellow (as the female's are year round) which keeps them -- and their food -- safe among the leaves. Bucernos bicornis is an Asian species, and even though its diet consists mainly of fruit, tarantulas have a place in it, too. Sometimes reaching 3.5 feet long, the great hornbill can eat a great deal at each meal, which is why readily available fruit is often consumed. The hornbill's preferred method of eating caught tarantulas is to kill them with their bills, tilt their heads back, and toss them in the air so that they land in the throat and are swallowed whole. Like the toucan, the hornbill's large bill protects it from the potentially dangerous tarantula bite, and offers some space between the bird and its prey before consumption.